The fact that there are millions who are not waging bloody jihad does not negate that there are millions who are and that we are in their sights. Our ads do not concern peaceful people, which is evident. The ads serve to combat the propaganda (as evidenced in this Daily News piece) that disarms the American people in what promises to be a lengthy, bloody, ghastly war. Truth is truth. Truth is the recognition of reality. It is not a theory or a malleable thing that one can twist and mold to suit one’s ends. It is what it is. Aristotle said, “A is A.” Indeed, a rose by any other name would smell as sweet. And jihad by any other name (or ad) would still count millions of victims. As for Hamas-CAIR’s “my Jihad” ads, nowhere and at no time has CAIR recognized the genocidal tenets of jihad; nor have they instituted programs to combat jihad recruitment or the teachings that call for holy war. Whose jihad is more truthful? 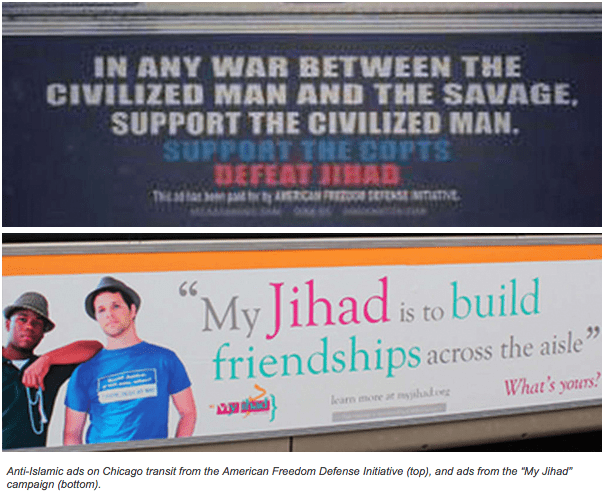 Anti-Islamic ads on Chicago transit from the American Freedom Defense Initiative (top), and ads from the “My Jihad” campaign (bottom). COMING TO a SEPTA trolley, bus or train-stop near you: Anti-Islamic advertising, courtesy of the far-right group American Freedom Defense Initiative. At least, that may be where we’re headed, after a judge’s decision last week seemed to clear the way for the AFDI to expand its transit ad campaign beyond New York City, where it’s currently assaulting eyeballs on Metro Transit Authority buses and trains. Back in September, the AFDI filed a lawsuit against SEPTA that accused the transit agency of violating the group’s free-speech rights when it refused to sell ad space to AFDI. SEPTA had argued that the ads presented false information about Islam; attorneys for the agency then lined up an expert on Islamic studies to argue as much. If it did, think of the political bloviating we’d be spared during campaign seasons. Or, to push the truth-in-advertising argument, other ads whose claims are ridiculous. So now it’s back to court for both sides, says attorney David Yerushalmi, who represents the AFDI. Opposing arguments will be heard and maybe, by Christmas, Goldberg will make a final decision about whether the AFDI’s ads have the right to jostle for space among all those SEPTA ads for Lundy Law, Geico and the iPhone 6. The AFDI will win this, I’m betting, as it did in New York City. As well it should. Free speech is free speech. Even if we dislike what it says or implies. How? By expanding the definition of the word “jihad” to mean “struggling in the way of God – the way of God, being goodness, justice, passion, compassion, etc. (not forcible conversion as wrongly claimed by some),” according to the website myjihad.org. The ads are quite moving and hopeful. But the AFDI, not surprisingly, thinks they’re a crock that need to be counter-balanced by ads with quotes from Muslim extremists whose “personal jihads” call for the killing of Jews and non-believers. Says Yerushalmi: “My client responds only to criticism of Israel or to the promotion of peaceful jihad. When [Sharon Geller, AFDI’s outspoken president] sees those ads, she responds” with ads of her own. Court cases similar to the one being waged in Philly are being litigated in Boston and Seattle, whose transit agencies have also refused AFDI’s ads. 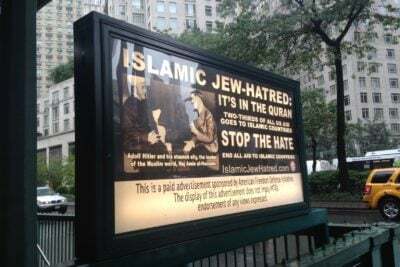 Other cities, like Chicago and Tampa, eventually decided to accept no ads of a political nature – including those “My Jihad” ads – rather than give equal time to AFDI. Philly apparently is following this easy-way-out lead. In October, SEPTA’s board voted to no longer accept political advertising on its buses, subways and kiosks. So when Judge Goldberg soon reconvenes for a final hearing, he may decide the “jihad vs. jihad” issue is moot. At least on our public transit. Elsewhere it will rage on, as it has for generations past and for our own children and their children – and, sadly, for generations to come.